SIBERIA’s early days do not defer much from those of any other groups but in some aspects like the clarity of ideas, the patience and the evolutionary work until reaching a maturity and a quality that few times cant find in the disc of newcomer ones. Alicante, Year 2000: Coming from other bands, they do SIBERIA: Javí Mentxa (guitar and voice), Fernándo Gomis (bass), Isidro Mentxa (drums) and Moi Dieguez (guitar and choirs). First demo tapes of exclusively internal use, a sound that are taking own personality and some that another direct one. 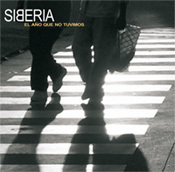 October 2003: Noelia Carbonell to the piano, organ and sintethysers is gotten up with which the sound of SIBERIA acquires a new and richer dimension. Its sound already can classify like "direct Songs, pop melodies, sharpened guitars and atmospheric passages; letters that speak of feelings, personal experiences, psychic states, experiences... from the pop eclecticism of the most basic one to intense compositions in its development". Conscious that the experience contributes wisdom, they play frequently, polishing his putting in scene, arriving to share scene with Sterlin and La Habitación Roja. His first demo with diffusion "Vuelta a Empezar" serves as test and to wake up the interest of the most livened up by SIBERIA. December 2006: The group are ready to enter study. And does it with the producer Eugénio Garcia (Second, Schwartz, Hello Cuca). After four months of taken care of work, the result is "EL AÑO QUE NO TUVIMOS” (YEAR THAT WE DID NOT HAVE). In its own words: "Siberia practices ` indie-rock' very personal, we tried to obtain the perfect union of guitars on forceful and direct rythmical bases, with references to rock'n'roll of the 90 and with clear shades of pop". After a long time waiting for, "Otro Día” (Another day) is first hit single of a CD that it will want to remain safe from your reproducer. From now on when they ask you What you would take to a desert island? You will answer "EL AÑO QUE NO TUVIMOS".